While Jonny and the kids were away at the fossil festival, the main project that I tackled was sorting through and reorganizing books. That wasn’t really the way I planned to use most of my time, but in the end I am glad I did it. I posted a photo near the beginning of the process, and Dwija asked if I might share how I organize books. She asked, “By topic? 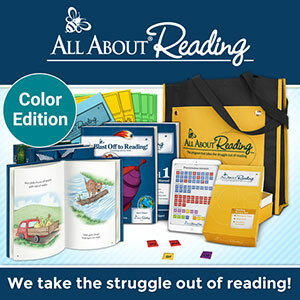 By reading level? 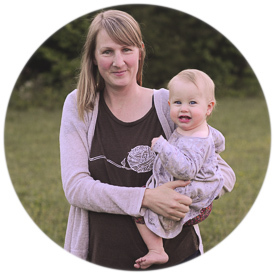 Fiction vs. non-fiction?” So I thought I would give you guys a little book tour. 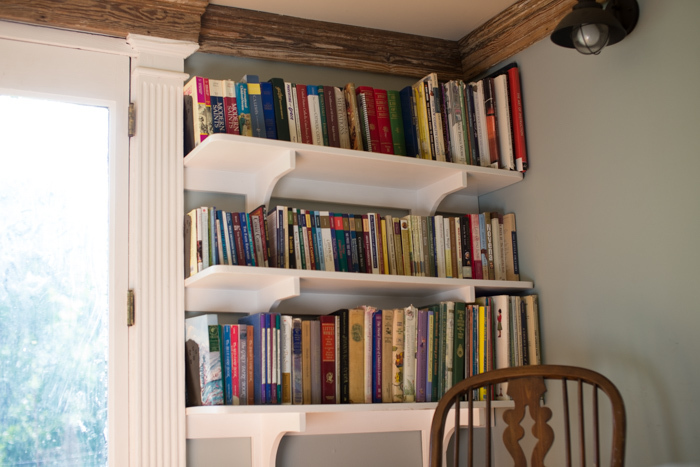 My book organization skills are not necessarily something to emulate, but we do have shelves in lots of places, so maybe this will be more of a “How to store lots of books in a small house” post. This is our main living area. (I feel I should add that the couch typically has a slipcover. It was in the wash.) Jonny installed shelving on both sides of the big windows many years ago. On the right side, the bottom shelf has children’s books. Mainly collections and a few others that I keep together that my kids frequently reread: All our Holling C. Holling books, D’Aulaires’ , and lots of fairy tales. Above are some of our larger compilations of stories of the saints, and many of my books on faith and Catholicism, along with a random assortment of books too tall to fit somewhere else! On the left the bottom shelf holds a somewhat random assortment of children’s fiction and non-fiction. My collection of vintage Gene Stratton-Porter , sits next to The Story of the World . I guess there’s not much in the way of organization there. Above are most of our books on farming and homesteading. 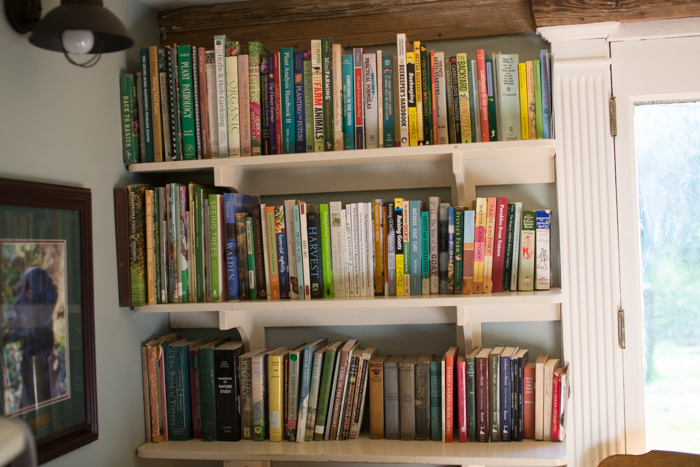 There are goat books, beekeeping books, gardening books, herb books, and lots of others along those same lines. I also keep all of our tree books here including the ones that are part of the tree and forest study that I put together many years ago. This is our Little Oratory, which is in the same room as the shelves above, and inside I store my kids’ books on our Catholic faith and the saints. I donated quite a few books to the thrift store during my organization process, because it really is possible to have too many, and I removed more than half of our children’s picture books from the house. These are stacks waiting to be moved out to our storage building. We have too many picture books, and Silas spreads them all over the house. Just on the other side of this wall is a teensy-tiny bedroom and outside the room there is a dark little entry way and a random high shelf where I keep my craft books. It’s nothing pretty to look at, but it serves its purpose. Inside that teensy-tiny bedroom there are shelves around the ceiling. 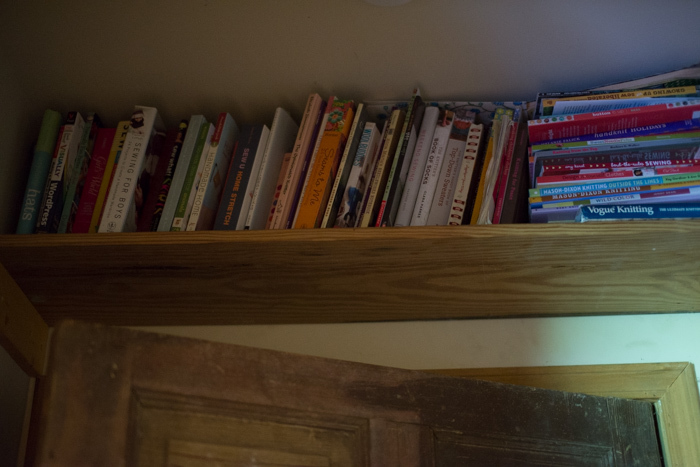 Right now, Seth and Gabe store their books and things there, but sometime this year it will become the girls’ room. You can see more photos of these shelves here. This is our piano room, on the other side of the chimney from our living room. It is essentially just one big room with a chimney in the middle. I reorganized this side while Jonny and the kids were gone (still in process when I took this photo), because up until the day they left, he had his office equipment here. (You can just barely see the edge of the piano in the bottom right corner.) I moved all of our field guides into the little shelf next to the desk. (I am often asked what our favorites are, to which I have to say, “All of them!” Though I often suggest North American Wildlife as a good starting point. We are on our third copy, it is so well loved in this house. 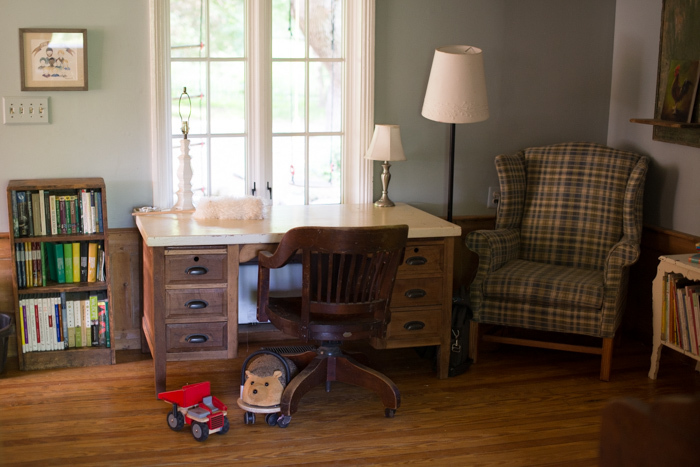 This little old shelf that sits next to the plaid chair was my mother’s as a child. I keep mainly children’s poetry books here, but looking at this photos, I see a few books that shouldn’t be there! 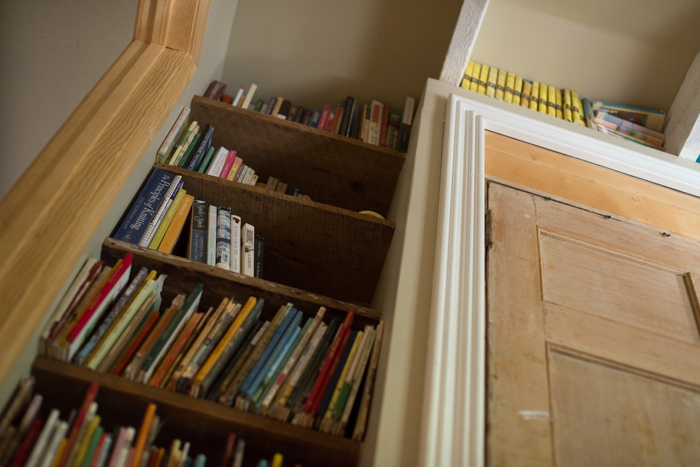 In the bedroom at the top of the stairs, the one with the never-ending triple bunk project, most of our juvenile fiction is stored on a set of shelves that Jonny built into the wall. Across the room from the bunks (all eight feet or so of it) Jonny snuck a little shelf into the back of the stair rail. 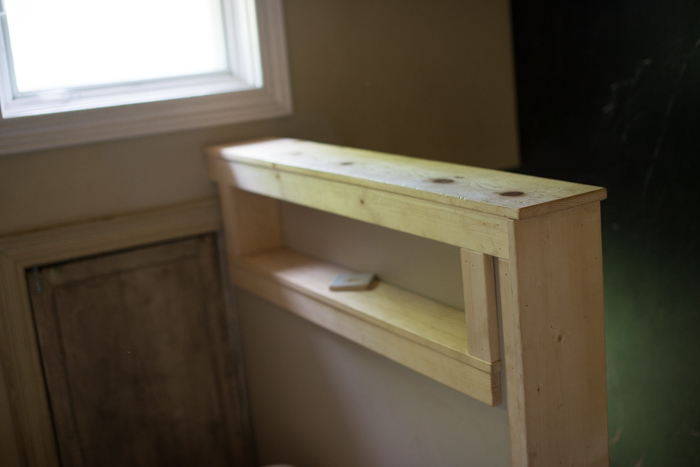 There will be a twin bed here and that shelf will make a nice little spot to store books. Next to the triple bunk room, on the other side of the chimney, is our bedroom. We have one simple shelf that runs the length of one wall. Most of my fiction is stored there. Many are books I have already read but kept because they are classics that I will share with my kids one day, but there are also books there that I hope to read someday. 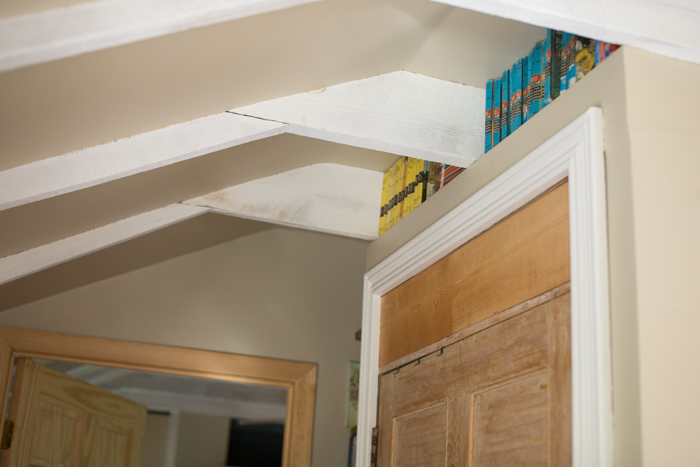 For the longest time our vintage Nancy Drew and Hardy Boys books have been tucked over our bedroom closet. 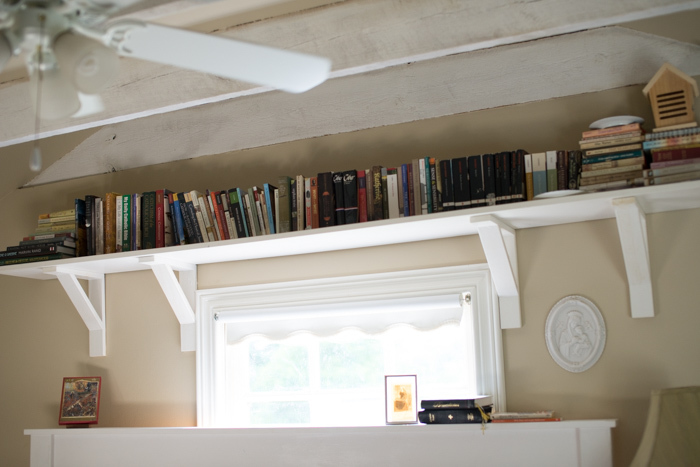 And then, tucked between our closet and the wall separating our room from the triple bunk room, years ago Jonny installed a set of shelves against the chimney. These books are arranged in a variety of ways. Some by topic, some because they are special to me and I don’t want them destroyed (old picture books). Some because I don’t know where else to put them. The two bottom shelves hold the only picture books in the house now. The kids are welcome to rotate them with the rest of the books that are housed in Jonny’s shop/office. I keep one semi-empty shelf here as well for books out of place, books that I am either currently using, or need to put away. And finally, this. 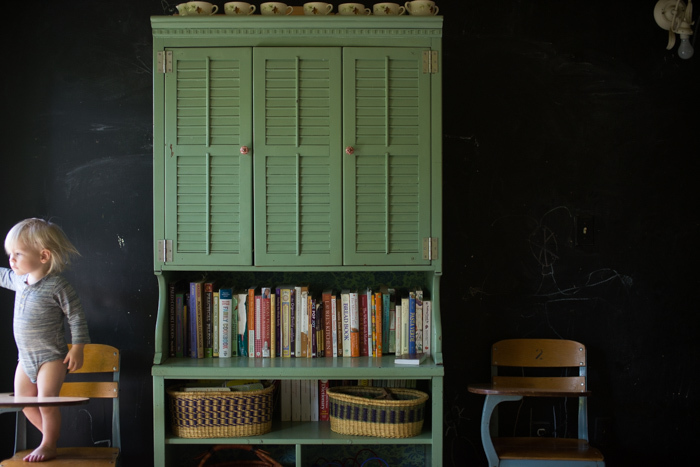 This is the chalkboard wall in our kitchen, and it has been home to all sorts of different furniture over the years. 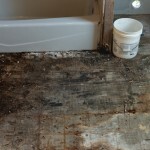 I just took this photo this morning, to show you the latest. 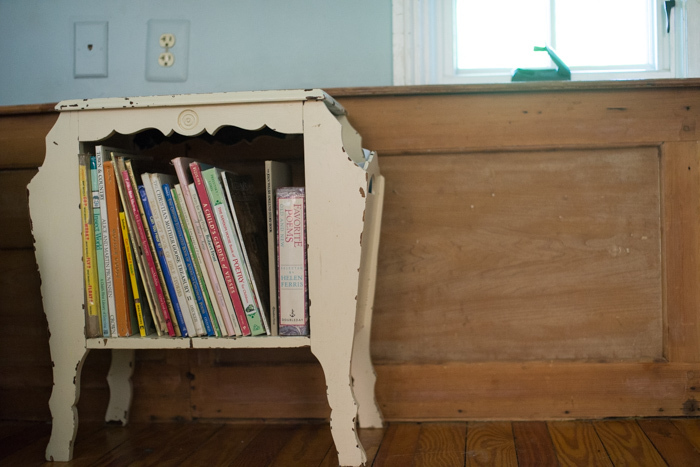 This hutch belonged to my friend Sarah. She painted it to match my kitchen cabinets because she liked the color, and she stored craft supplies in it. Her family is moving and downsizing, so I inherited it. I’m sure you can imagine how special it is to me. Inside the doors are our homeschooling books. The open shelf contains my cookbooks, and tucked on the shelves below, behind the baskets, are early readers along with some books that don’t belong there (of course). I came across this post quite by accident. I remember it from last summer but seeing it again, it’s quite possibly one of my favorite that you’ve written. Maybe it’s because I’m that fond of books, but I love how you have found the most ingenious shelf space for them. Dear Ginny: I have followed you for several years and constantly delight in the wonderful things that your family does together. 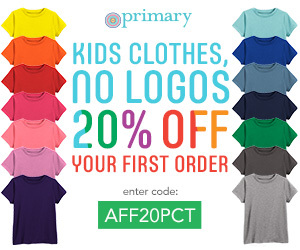 I have raised my children, and some of my grandchildren, and had extra children at one time for 2 years (the mother dropped them off for babysitting and never came back – they were 2 and 4 – finally reunited with their father); and spent two years raising my young great-nephew from when he was 6 to 8. Although I am an older lady (is 69 considered an older lady?) and receive social security, I still work a full-time job. I have often considered taking in foster children but am not sure if I am too old to be approved. I thoroughly miss a mass of kids at my home…its back to school time and my instinct is to stock up on pencils, notebooks, folders and binders. Or perhaps I could babysit and that would fill my need for children in my home. Any thoughts you have would be appreciated. Oh, and I love all your bookshelves. I realize I have bookshelves in almost every room in my house and should probably attempt to consolidate them into one room. I have an entire bookcase for my Agatha Christie collection, and another one totally filled with my Christian books, bibles and such. Anyway, love your family and wish I could knit (I crochet, but could never get the hang of knitting). Thanks and blessings. This is wonderful Ginny. You have a really lovely home. My 19 year-old daughter home from university for the holidays was delighted to find most of the Victorian novels on her reading list for next year on our bookshelves. I should show this to my husband! He is complaining about all my books because we are moving and most of our boxes are full of books . . . 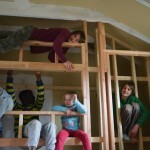 I posted on our “children’s library” and bookshelves awhile back: http://www.theengagedhome.com/childrenslibrary/ Someday when we buy a home instead of renting, I will ask my husband to build in shelves–that would save so much space. Our books shelves take up a lot of space! I love this! The photos of the Nancy Drew and Hardy Boys books really brought me back. Makes me want to curl up on a window seat with a stack. Your photos are beautiful and fun. I love all your shelves and books tucked in around your home. I love the old classic books like Nancy Drew. We have a few Hardy Boys and I have Bobbsey Twins that were mine and I bought Happy Hollister books off of Ebay several years ago. 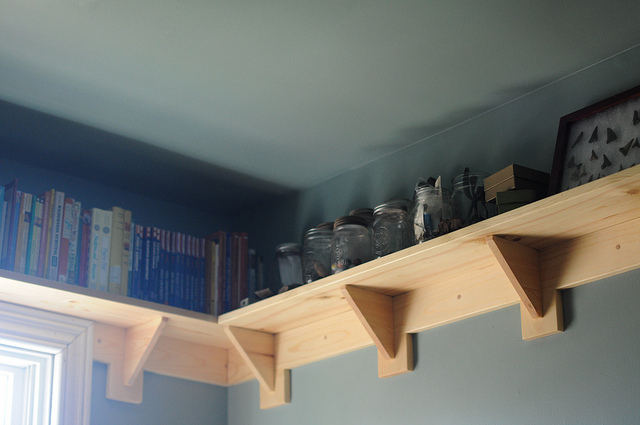 I really love the shelves your husband built beside your doors. Lovely! Ginny, I am a long time reader but first time commenter. Thank you for sharing your life and your immense talent with the world through this blog. 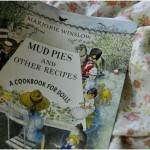 You have moved me to tears and to fits of laughter and to moments of contemplation through your pictures and writings. 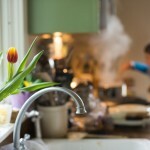 As a Catholic mom of two little ones, I am discerning whether homeschooling is something I could undertake. Seeing all the perfection in the imperfection you so honestly capture makes me feel the joy with which you live your life. In this Pinterest era where all the “messy”is cropped out of the photo I appreciate your honesty. Your life is so beautiful but that is, no doubt, because of how you live it and see it. Ginny, would you mind sharing the name of the blue paint color in your living room? It’s exactly what I’m looking for in my bedroom. Lovely, inviting home! I love your shelving innovation! 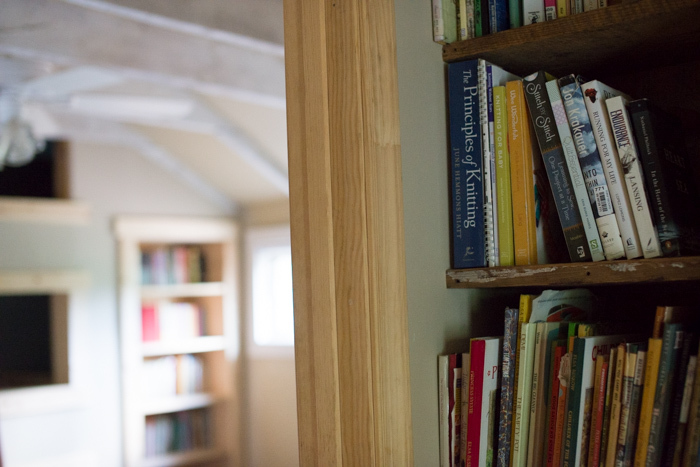 We also have a small house, lots of children, and many books. I’ve shown my husband pictures of your shelves in the past to try to motivate him, but we still have books-stacked-in-front-of-books, unfortunately. 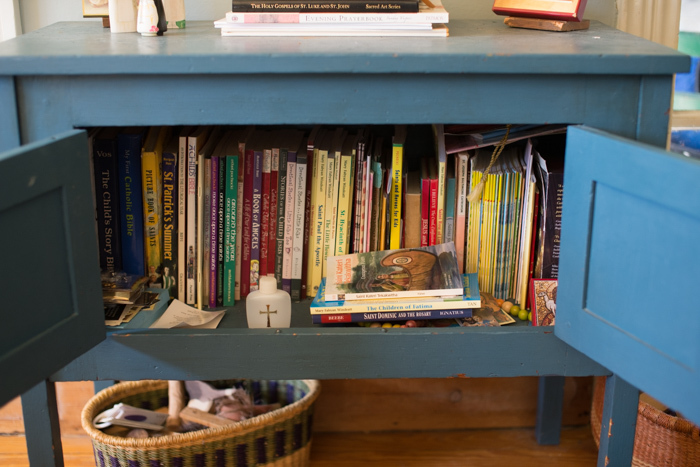 Your saint’s book collection made me think of a question: I am arranging a Waldorf-inspired second grade home school lessons for my oldest daughter. The theme is Saints and Heroes. There are so many saints, many with interesting stories (and some with inspiring but violent, not really child-appropriate stories, too), I feel overwhelmed with choosing only a few really good ones to work with for those lessons. What are some of your family’s favorite saint stories? I loved seeing your book collection and where you tuck them in. A true book lover. I have books in every room and book shelves as well. I cannot imagine a house/home without books! Oh I’m glad to see your books! I always wonder where the books are when we visit other homes. We do have a lot, and our storage isn’t as good as yours! Thanks for the inspiration! We have books all over the house too. My husband’s dream is to have a library where we can keep all the books in one room. I love all the bookshelves that you have. 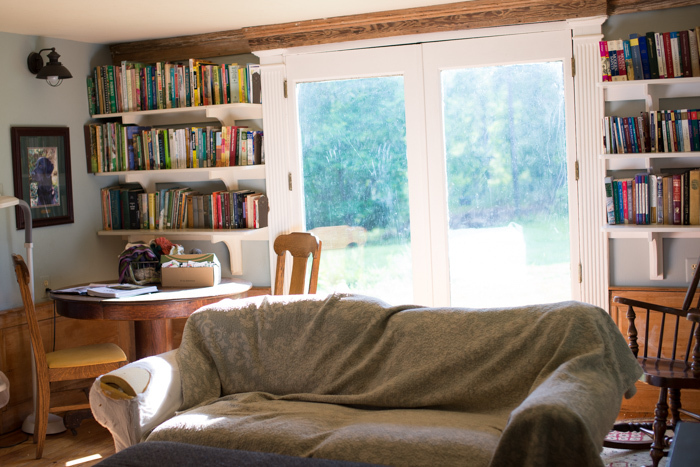 And I love that someone else has books in every room of their house! You books are much more organized than ours are. Thanks for sharing. I love all of this. I really should put shelves up around the top of my rooms…..it’s a thought? 🙂 Get me to the lumber store! lovely! we still pray for Sarah’s family, so hard. what a beautiful hutch. So special for you. Loved your book tour 🙂 those white shelves I think are my favourite of the shelves (outside the hutch of course, and that darling table that was your mother’s)! all very lovely!!! I love everything about this post. Your shelving is just so amazing. I would love to curl up in a corner somewhere! I especially love the green hutch and your mom’s little cabinet. I can’t bear to part with a book – or cut down a tree…. I’m not sure if those things are correlated, or not! 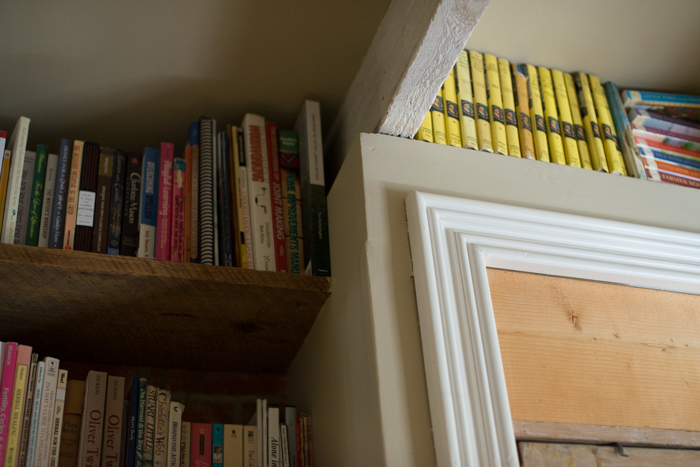 Looking around our house recently, I realized we have books in every room of the house (well, the ones in the bathroom are temporary). 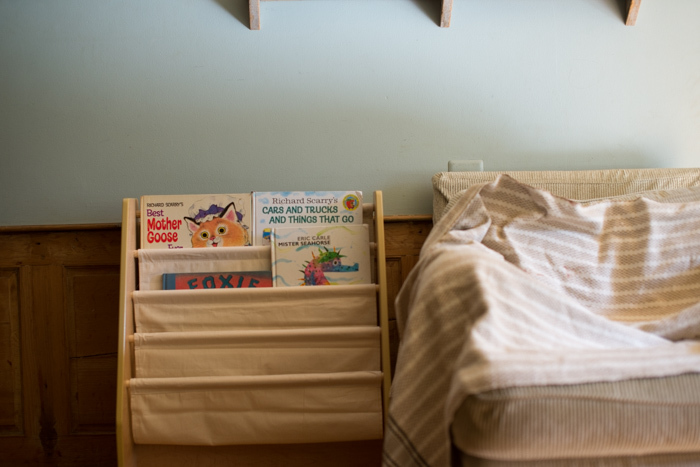 Cookbooks in the kitchen, of course; craft and DIY books in the laundry room; and each bedroom has its own stash. 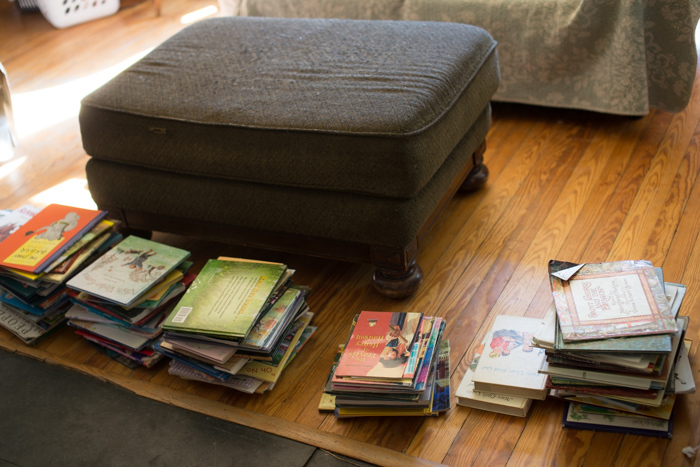 The living room and dinning room (which we don’t eat in since it has become our schoolroom/playroom) are the main “libraries.” One of my sons decided to count the books we had in the house and he made a rough estimate of 3,000. There are probably just as many in my husband’s office on our property. It can get a little frustrating keeping it all organized, although I think I have a pretty good system. It’s just getting everyone else to return books where they belong. Even though my youngest is 8.5, I still keep a lot of picture books because I’ve noticed it is getting harder to find some of the good ones and I want to pass them on to my grandkids. When the all the kids leave home, my dream is to devote one of the bedrooms to a real library. Lovely hutch! Thanks so much for sharing this! I have tubs and boxes of books I haven’t unpacked yet….you have given me inspiration to find ways to display them all. How special! I love old farmhouses and love how you guys have made it your own. Thanks for sharing. 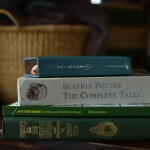 I spied Margaret Hodges’ Saint George and the Dragon in a pile – love that book, esp. Trina Schart Hyman’s illustrations. I love this! I think the books and shelves are so pretty to look at plus its such good use of space. I’m inspired. I loved the book tour, but got mentally sidetracked on one thing – what is an observation hive and would it be located INSIDE the wall of your house?? I’m so curious! I’m imagining the type of glass hive that museums have where you can see all the inner workings of the bees’ home, but gosh I’m wondering how that works inside your home! How wonderful and special that you have Sarah’s hutch as a daily, practical, tangible reminder of her. 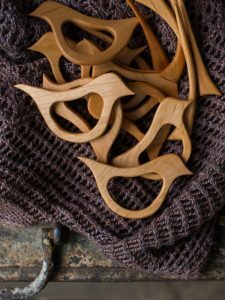 Very beautiful – and it’s a lovely piece of furniture in its own right. I got waylaid on your post about your dog. It brought tears to my eyes. We also had a lab, who lived to 10 1/2, but got a tumor on the spleen. We, too, got him before we had kids. Down a few dogs later, our dear 15 1/2 year Sheltie doesn’t have much longer. What a process old age is. I’m impressed with all your books and fun shelving. I usually resort to stacks! Oh my goodness, I love this, Ginny! Your home is so beautiful, and so down to earth. Love the shelving tucked everywhere! Love it! You have a beautiful home Ginny. 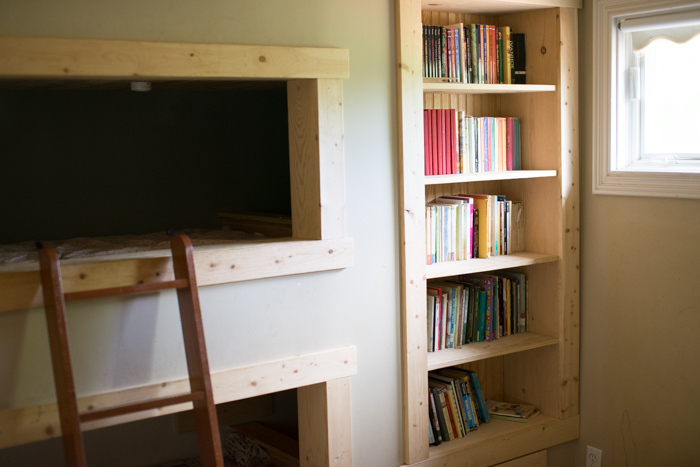 I think those special nooks and cranny’s are wonderful…and Sarah’s hutch will be such a memory forever. Thank you for sharing. Everything is so neat and clean. I’d be afraid to show my house…people might say I’m a hoarder. Ha Ha Not really, but I need to make more runs to drop off at Goodwill. My daughter just told me this morning she’s ready to move in with me this weekend with her 3 kids. I’ve got your sister’s chore board all ready to go…and I’ve cleaned everything out of the guest bedroom dressers for their clothes. So many things to do and so little time. Can’t wait until tomorrow to see what you’ve completed with your knitting. I just finished Clue 2 on the mystery knit last night and plan on starting Clue 3 tonight. Thank you for the tour! You really are quite organized! I like it that you have places to display your books whereas ours get stored in boxes and tubs when we outgrow the ones we don’t donate! 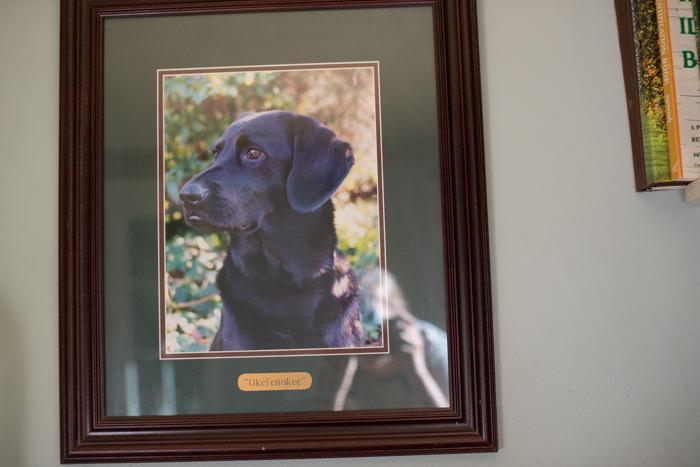 Great job on framing the dog photo. I like it that it has a name plate too. Blessings to you and yours.